RAF Worthy Down, was a Royal Air Force station located 3.5 miles (5.6 km) north west of Winchester, Hampshire. The Camp at Worthy Down has had an interesting and varied- history since it came into service use in 1918. At one time the site of the Winchester Racecourse, it was requisitioned in September, 1917, by the War Office for use by the Wireless and Observers School of the Royal Flying Corps which at that time, prior to the creation of the Royal Air Force, was under the control of the Director of Air Organisation at the War Office. It is interesting to note that the Officer who did the initial reconnaissance of the site was a Lieut. Colonel J. A. Charnier, who subsequently became Air-Commodore Sir John Charnier, and that he wrote in his report that the country around the Site consisted of large open fields and downs which were quite ideal for forced landings a very necessary provision in those days. The school was re-named "Artillery and Infantry Co-operation School" and then in 1921, as the School of Army Co-operation R.A.F., it moved from Worthy Down to Old Sarum. In 1924, Worthy Down became the home of a Bomber Flight of No. 58 Sqn, R.A.F and from then on it was developed as one of the main Bomber Stations of the Royal Air Force. Many of the famous names of the Royal Air Force are associated with No. 58 and 7 Squadrons R.A.F, which were based on Worthy Down during the late 1920s. 7 Squadron was commanded by Wing-Commander C. F. A. Portal, who was Chief of the Air Staff, 1940-45, and became Marshal of the Royal Air Force Viscount Portal of Hungerford. 58 Squadron was under the command of Wing-Commander A. T. Harris, who was Commander-in-Chief, R.A.F. Bomber Command, 1942-45, and became Marshal of the Royal Air Force Sir Arthur Harris. Two of his Flight Commanders were Squadron-Leader (later Air-Marshal Sir Robert) Saundby and Squadron-Leader (later Air-Chief-Marshal Hon. Sir Ralph) Cochrane. These squadrons were Night Bomber Squadrons, equipped with Vickers Virginias (bomb load of about 1,000 lbs., range 700 miles, speed 70 m.p.h.). No. 7 Squadron earned the distinction of winning the Laurence Minot Bombing Trophy of the R.A.F in 1927 and 1928 and, though the strength of the Station was comparatively small, it won the R.A.F "Rugger" Championship in 1926/27. Many of the buildings in the present camp, such as the Officers' Mess, Barrack blocks and some of the Married Quarters, were erected at this time, when it seemed likely to become a permanent station for the Royal Air Force. The Station Church was dedicated by the Bishop of Winchester on 19th January, 1930. As time progressed, however, and the design of aircraft became more advanced, the " up-hill" runway of Worthy Down became too hazardous for use by Royal Air Force planes, and on Empire Day, 24 May, 1939, it was handed over by the R.A.F. to the Royal Navy, who found it suitable as a land-base for planes of the Fleet Fighter Squadrons Nos. 800 and 803. The camp at Worthy Down was then commissioned as H.M.S. Kestrel and became the training school for Telegraphist Air-Gunners during the early days of World War II. In late 1940, the notorious "Lord HawHaw" made one of his more remarkable announcements, when he claimed that H.M.S. Kestrel had been bombed and sunk. In fact, it was bombed and minor damage was done, but it nevertheless remained "afloat." The planes flown by the Fleet Air Arm in those days were mainly Sharks, Swordfish and Fulmars. One war-time Naval Officer, who was trained there was Sir Laurence Olivier who has stated that he got to be quite a good pilot "after a ghastly first day of taxi-ing one Shark into another." The airfield ceased to be used, except for light planes, in 1942, and H.M.S. Kestrel then became a School of Aircraft Maintenance and after the end of the war a Rehabilitation and Vocational Training Centre. Additionally Supermarine used the airfield in the development of the Spitfire from December 1940 to March 1944. Early in World War II Lord Beaverbrook originated the idea of the "Presentation" aircraft. An individual, organisation or town could present the cost of an airframe (for a Spitfire this was set at £5,000 although the real cost was nearer £12,000!) and an aircraft would be allocated to bear the name of the donor (or any caption they chose instead) in (officially) four inch high yellow characters on the fuselage. The official style was not always adhered to, however. Other aircraft types than Spitfires were also presented, but there were more "presentation" Spitfires than any other aircraft type. Many towns and organisations had "Spitfire Funds" and went to great lengths to raise the money required. Although the total number of "Presentation Spitfires" is not absolutely clear. Since the vast majority of Spitfires presented were either Mk I, II, or V (or originally ordered as such) this represents around 11% of the total production. Crashed into the sea off IJmuiden on 19.7.43, killing the pilot, Flg Off Frank Thorburn Brown who was buried in Oldenburg War Cemetery. The site was handed over to the Royal Army Pay Corps on 1 December 1960 and a major re-build took place, with only a few of the old buildings surviving. It was possibly one of the first examples of "Save now to Spend later" as constant maintenance problems for the cheaply built flat-roofed buildings have proven since then. The rebuild was completed when on 10 June 1961 John Profumo, the Secretary of State for War, officially opened the camp. As well as becoming the RAPC Headquarters and Training Centre, Worthy Down became home to their Electronic Accounting Development Unit who housed their computer centre with its IBM 705 system there. The computer was used to process the 1961 UK census electronically for the first time. With the merger of the Royal Army Pay Corps into the Adjutant General's Corps in 1992 the barracks became the headquarters of the Adjutant General's Corps and training depot for members of the Staff and Personnel Support, Education and Training Services and Army Legal Service branches. Google Earth Image - Worthy Down before redevelopment. 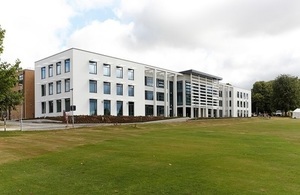 In 2012 the RAF School of Administration moved to Worthy Down from Southwick Park, near Portsmouth, resulting in all three schools of the Defence School of Personnel Administration being co-located on one site. On 9 June 2014 the Ministry of Defence announced that a new £250 million Defence College of Logistics, Policing and Administration was to be built at Worthy Down, with training facilities and living accommodation for up to 2,000 students and staff. The facility, which will bring the training for key support roles for the Army, Royal Navy and Royal Air Force onto a single site for the first time, scheduled for completion by late 2018. Military personnel from the Royal Air Force, Royal Navy and army enjoy brand new facilities at Worthy Down camp in Hampshire, thanks to the Defence Infrastructure Organisation and Skanska. The flagship College building at Worthy Down. Photo courtesy of Skanska UK. A flagship college, recreational space and high quality accommodation are all part of the completed first phase of works, part of the transformation of this tri-services amenity. To date, over 36,500sqm of floor space has been built, creating new surroundings where RAF, Royal Navy and Army personnel can live, work and train. 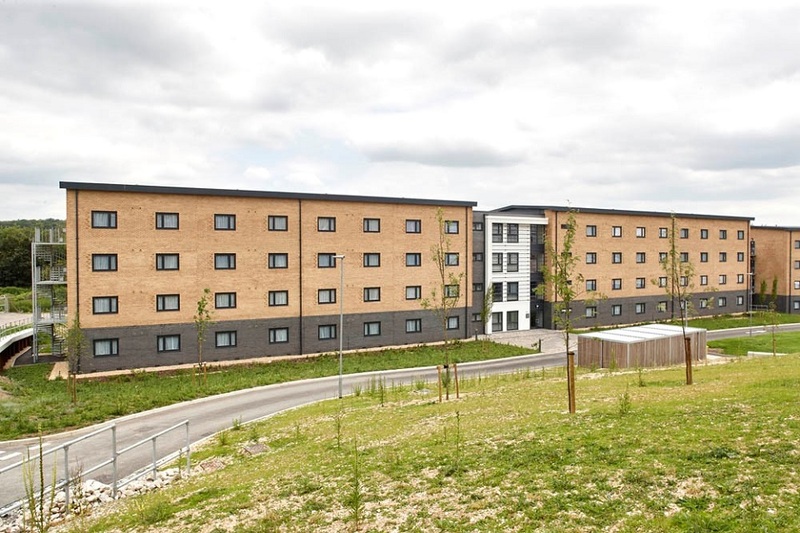 Using almost 1 million bricks in the process, the Skanska team and DIO have provided the Defence College of Logistics, Policing and Administration with a 154 seat lecture theatre, 60 brand new homes for military people and their families, 755 single-bed spaces in 6 new blocks and a 358 seat canteen. The site’s new, larger water tank holds 324,000 litres, almost half the capacity of an Olympic-sized pool. The Catering, Retail and Leisure facility is the social hub for permanent staff and visitors. Photo courtesy of Skanska UK. DIO supports service personnel by providing and improving single living and service family accommodation so we’re pleased to be working with Skanska to deliver these facilities. 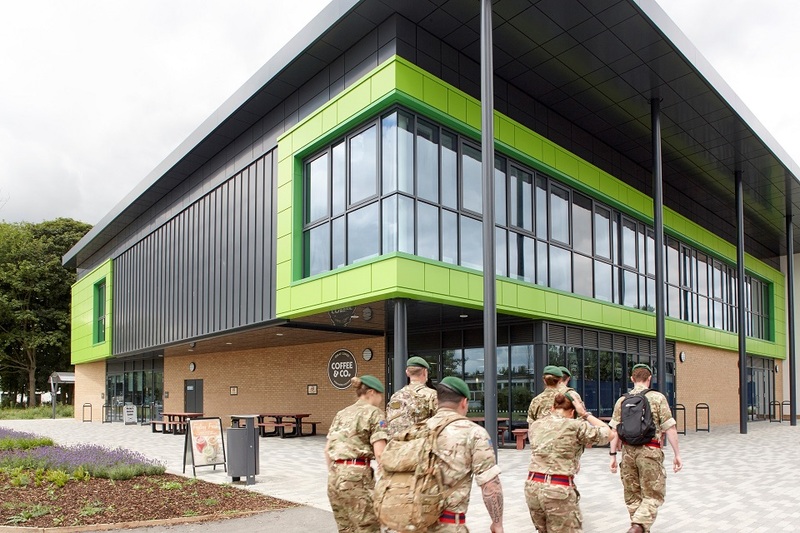 Once the new facilities are complete it will enable the MOD to train personnel more efficiently and effectively so that they can provide the best possible support for military operations. The facilities provided to date are very good. There is a lot of excitement around the camp regarding the college, recreational space and accommodation and I look forward to welcoming future military personnel to the camp. This flagship project is helping the Ministry of Defence (MOD) to provide its people with great places to live and learn. We’re also making a positive contribution to the local community by engaging with schools and community groups. To date, we have worked with over 1,600 young people and we have arranged a number of student visits to the site. The team delivering Worthy Down camp has also scooped three consecutive national gold awards from the Considerate Constructors Scheme (CCS), which aims to improve the image of construction. One of the SLA blocks on the site at Worthy Down. Photo courtesy of Skanska UK. Building Worthy Down is one part of a 2 part scheme for the DIO called Project Wellesley. The second is the development of a new community called Mindenhurst, in Deepcut, Surrey, where the MOD is vacating Princess Royal Barracks. Combined, the 2 parts will help the MOD to rationalise its estate and improve its training provision and living quarters.